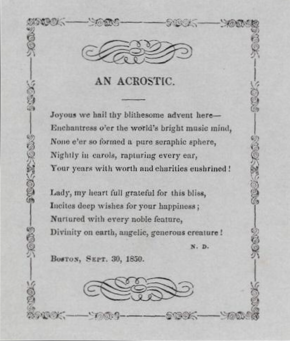 An 1850 acrostic bi Nathaniel Dearborn, the first letter o ilk line spellin the name "JENNY LIND"
An acrostic is a poem (or ither form o writin) in that the first letter (or syllable, or wird) o ilk line (or paragraph, or ither recurrin featur in the text) spells oot a wird, message or the alphabet. ↑ "Acrostic Poetry". OutstandingWriting.com. Retrieved 2011-04-30. This page wis last eeditit on 20 October 2017, at 01:07.